PM 147 is no longer available for issue and must be replaced. It is being replaced with tritium (H3). a. General. When a sight activated with promethium (PM 147) is found, the sight MUST be removed and turned in for disposal in accordance with AR 385-11. Contact the local RPO. b.Identification. Promethium sights are marked with the assembly date, radiation symbol, and PM 147, 1 mc. c. Decontamination. If a sight activated with promethium (PM 147) is found, conduct a survey under the direction of the local RPO. Decontaminate as required in accordance with local procedures. 2-12. INITIAL SETUP. The following will reduce the space required for the initial setup portion of the maintenance procedures. a. Materials Parts required are not listed unless they apply to the procedure. b. Personnel Required is listed only if the task requires more than one person. If Personnel Required is not listed, it means one person can do the job. 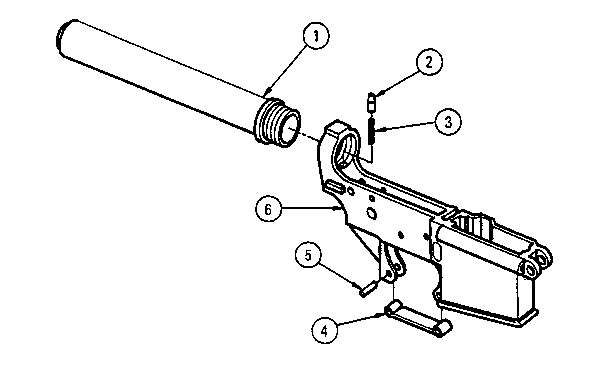 c. Do not scratch, etch or stamp numbers, letters or any other information on bolt, bolt carrier, buttstock or other piece parts. d. The normal standard equipment condition is that the item is removed from end item or next higher assembly and is in the assembled condition. Equipment Condition is not listed unless some other condition is required. e. The approximate time required is listed on the applicable Maintenance Allocation Chart (MAC). f. When the term evacuate to direct support maintenance is used, the entire weapon must be evacuated.